Every dish is based on an actual dish from an eatery in Singapore. Some have a history going back to the 1920s. It started off as a proposal for a Peranakan restaurant. In the process of drawing the kueh, I was fascinated by the plethora of kueh from the various cuisines around Southeast Asia. Each piece led to the discovery of kueh I never knew. 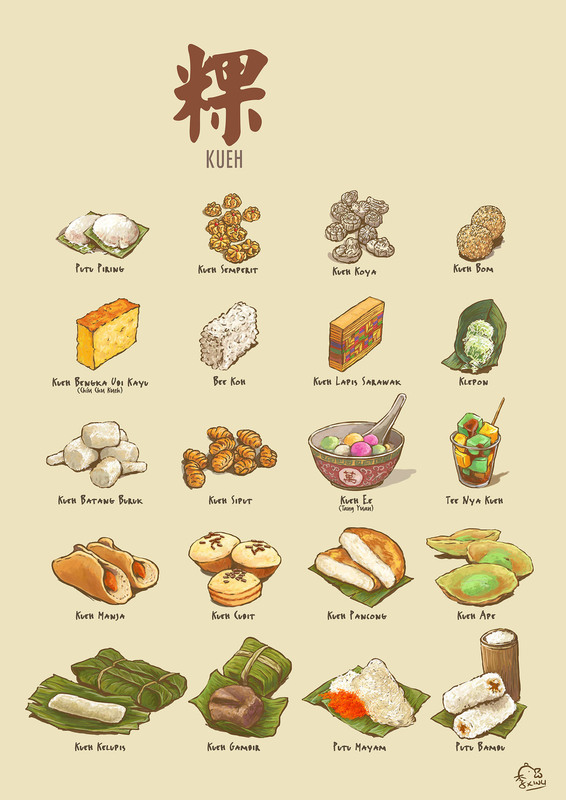 Kueh has many names. I have chosen to use "kueh" instead of kuih, kway or kue. When enjoying. 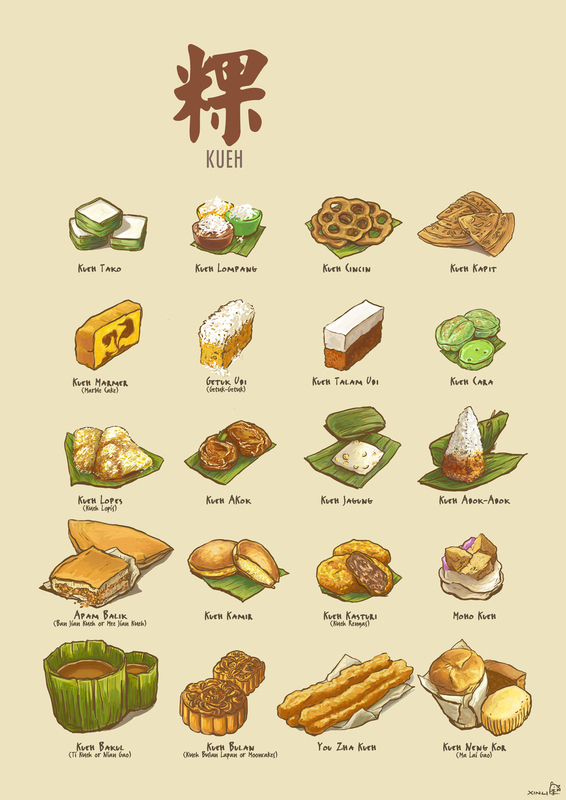 There are many forms of spelling for each of the kueh from Baba Malay, Malay ,Indonesian to Chinese. I have included some of the alternative names and used their common names as well for the 3 pieces. The Lunar New Year is a important festival for the Chinese around the world. It is also a period of feasting and here are some of the festive snacks enjoyed in Singapore or the Southeast Asia. Here is a compilation of the different kinds of mooncakes available out there, some may look similar but have different textures for their crust due to different ingredients and methods etc. Others have different flavours. These are only a fraction of what is available out there. Similar to kueh, you might find variations of the same style of mooncakes in both their place of origin and beyond as well. This work was featured on Localiiz (HKG) in September 2014. Food in Thailand is more than just Mango Sticky Rice and Red Ruby, which are a couple of khanom you can find in Thailand. Khanom refers to the sweets and snacks in Thailand. These are just a few of the khanom you find in Thailand. Looking through the range of khanom, you might find some of them looking quite similar to the kueh you find in Singapore or Malaysia.